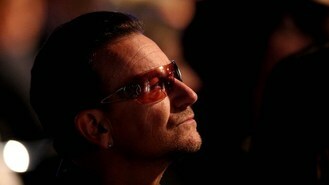 U2 frontman Bono and a long list of world leaders will attend next week's Global Citizen Festival to help fight poverty. United Nations Secretary General Ban Ki-moon, leaders from several countries and US Congress members will join Stevie Wonder, Kings Of Leon, Alicia Keys and John Mayer at the free concert on September 28 in New York's Central Park. The concert coincides with the United Nations General Assembly and fans can earn free tickets for helping spread the word or volunteering to help end world poverty. Bono will present Liberian President Ellen Johnson Sirleaf with a Global Citizen Movement Award for her work on women's equality. Crown Princess Mary of Denmark, Malaysia Prime Minister Najib Razak and U.S. Congress members Earl Blumenauer, Charlie Dent and Kay Granger also are expected to attend. Chris Brown has admitted he doesn't understand why the public judge him more harshly than other rappers such as Jay Z.
American pop singer Jason Derulo has scored his third UK number one after his latest single, Talk Dirty, knocked Katy Perry from the top of the charts. Sir Elton John may not have a current hit on the radio, but he earned the most cheers at the iHeartRadio music festival in Las Vegas. Sir Paul McCartney is to play his smallest UK gig for years - to an audience of just 200. Kendrick Lamar avoided any talk of his latest controversy as he performed at the 2013 iTunes Festival. Lady Gaga is set to salute Carole King with a musical tribute. Rihanna has paid tribute to her fans in the documentary, Half Of Me. Rita Ora and Calvin Harris have sparked speculation that they could be working together after they were spotted heading into a recording studio together.